Are you tired of manually changing your IP Address? All that left clicking then right clicking through menu's - don't get me started on the tabbing too...well I am tired of it! That's why I developed Easy IPChange. A light, fast and easy to use script to quickly change the IP address of any network adapter. Easy IPChange can be launched directly and used with a nice batch GUI or even automated with CLI arguments! Sweet! 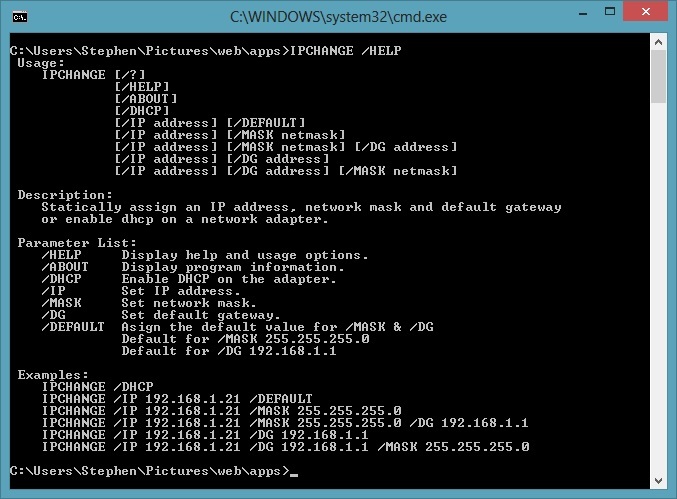 IP change has been developed as a batch script (.bat) designed for the XP command interpreter however is forwards compatible with any current windows OS (Win7 & 8 may need to 'run as admin'). Check out the batch code below. Easy IPChange is the best free IP Changing script out there so check it out and add it to you admin toolbox today! If you don't like it - tell me about it...and if you do - Win Win! ipconfig /all | find "Ethernet adapter"
echo  Enter the adapter name you want to configure. echo     or enable dhcp on a network adapter. echo     /HELP     Display help and usage options. echo     /ABOUT    Display program information. echo     /DHCP     Enable DHCP on the adapter. echo     /IP       Set IP address. echo     /MASK     Set network mask. echo     /DG       Set default gateway.